“Come to me, all you who are weary and burdened, and I will give you rest,” Matthew 11:28. He warned us ahead of time there would be suffering in this world. Aside from challenges and burdens, there can be stress. We may have sick or needy relatives. We may have challenging coworkers. You may have family demands, obligations, or small children to care for. We may have church family that have burdens we help carry. The stress or burden may be a result of our unbelief in God’s promises. 1: God is strong enough to carry everyone’s burdens, we are not. Even though the Holy Spirit is our strength, He still calls us to cast our cares, burdens, and concerns on Him. If we try to carry the weight of the world, we will be destroyed. Even Jesus retreated for seasons to be alone with the Father. He knew His source. We are not God, we are empowered by Him. We (by ourselves), are not strong enough and we are limited. 2. God cares enough to carry our burdens. I love this verse: Praise be to the Lord, to God our Savior, who daily bears our burdens (carries us in His arms),~Psalm 68:19. People get overwhelmed when you rely on them too much, God does not. He does not grow tired or weary. You can approach Him at any time and unload your burdens. He is not limited; He is not human. 3. People are not God. Therefore, seek God first. God invites us into His family and most people have a biological or adopted family. God designed us for relationship. We get into trouble when we seek people first. People are not God. They can help, but God goes to the root and heals. Anything or anyone we put in the place of God becomes our idol. Idols will always disappoint. I truly believe sometimes God allows people to let us down so we stop putting them in His place. Only God saves. Jesus is the Hero! No matter what we face friends, we can rely on Jesus. Don’t place your hopes in yourself or other people. It may seem unbearable today, but I promise God is strong enough to carry your burdens. 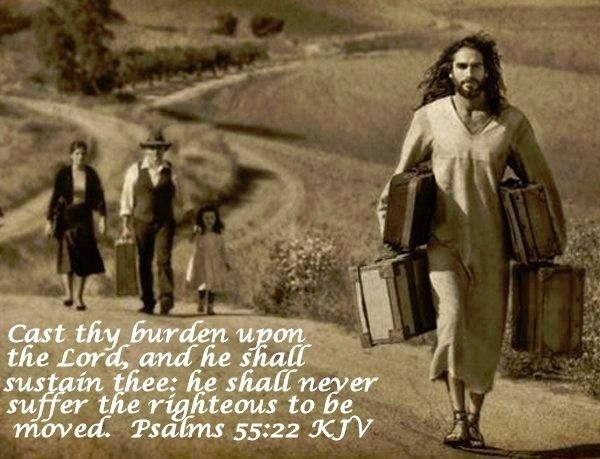 May we rest in His arms, the burden bearer. Believe God Can Do Anything! God is our sure hope! This is absolutely wonderful. I think we are tempted often to put people in place of God, and you are so very right…it is nothing less than idol worship. God is the only omnipotent, omniscient and omnipresent being, which is why Jesus told us to love Him with all our hearts, all our minds, all our souls and all our strength. That’s the first commandment. Thank you for commenting. Bless you. I’ve learned the hard way not to put people where God belongs, it always leads to heartache, pain, and disappointment. Even family can’t take His place. He is God and beside Him there is no other.